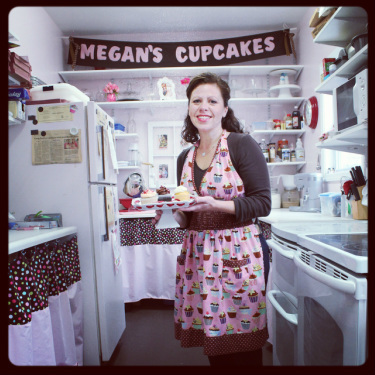 Bridget Coffey launched and operated Megan’s Cupcakes, the first cupcake-only catering company in northern Michigan. Adventures of The Chief Cupcake, which chronicles her journey opening and operating the business, is her first cookbook. In addition to offering a blueprint for launching her cupcake business, the book shares recipes that will delight anyone, from the beginning baker to the seasoned chef. You can find out more by visiting the Facebook page for Adventures of The Chief Cupcake. Bridget resides in Cadillac, Michigan, with her husband and two children. She earned a Bachelor of Arts degree in English from Western Michigan University. Megan's Cupcakes is a Michigan LLC (Megan's Cupcakes LLC). Megan's Cupcakes is licensed by the Michigan Department of Agriculture Food & Dairy Division. Purchase a copy today on Amazon. A sneak peak of Bridget in the cupcake test kitchen that is inspected and licensed by the Michigan Department of Agriculture.